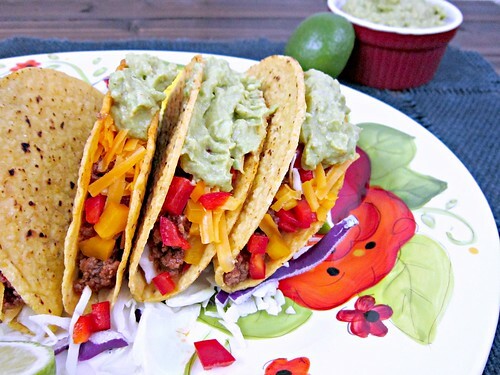 It’s my favorite day of the week y’all…Taco Tuesday!!! And for a change of pace, this week we have crispy tacos!! It’s kinda crazy how a little change such as a crispy taco shell instead of a soft tortilla, can make such a difference. But I guess texture and all that jazz does matter!! I have mixed feelings about crispy tacos. Back in the day (like, high school days) I used to love me some crispy tacos, especially on Taco Sunday. You know what I’m talkin’ about. But slowly I converted over to a soft taco gal. Seemed to be a better distribution of filling that way. Instead of getting a mouthful of only taco shell, lettuce, and tomato, I could actually get a bite with all of the filling at once! However, I still go back to the crispy taco every so often, because there’s just something about that crunch that I love. Maybe the same way I am obsessed with having chips on my sandwiches? Yes, I said ON. It’s good, yo. 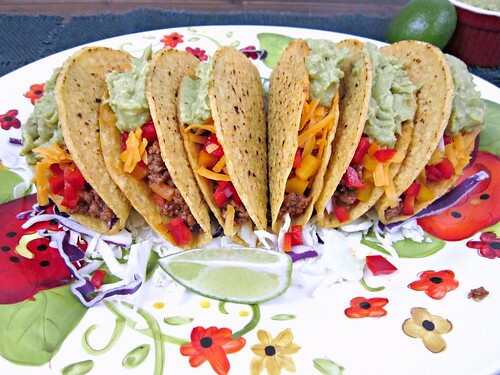 These tacos, with their spicy beef filling, crunchy bell peppers and slaw, and creamy guacamole and cheese are perfect in the crispy taco shells. J had some of the leftovers in soft tortillas the next day and said they were definitely better in the crispy shells. And I agree. So much so, that we are having crispy tacos of another variety this week, too!! So, if you love crispy tacos, or if you haven’t been such a fan of them in the past, definitely give these tacos a try. You’ll be so glad you did. Heat a large skillet over medium-high heat, add the ground meat. Cook, stirring to break up, until browned, about 4-5 minutes. Add the jalapeno and garlic and cook another 1-2 minutes until fragrant and jalapeno has softened a bit. Stir in the tomato puree and seasonings, reduce heat and simmer about 10 minutes. Add the lime juice, garlic powder, paprika, cumin, salt and pepper, and stir to combine. Taste and add more lime juice or seasonings as you prefer. 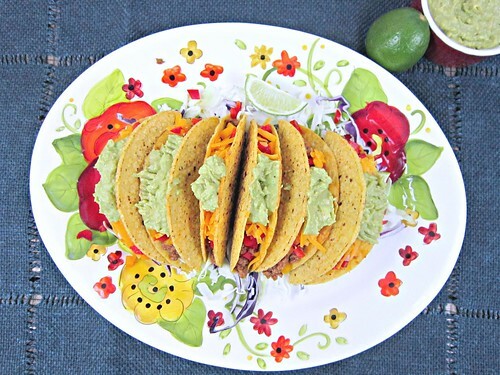 If using crispy taco shells, heat in oven or microwave according to package instructions to crisp them up. To assemble, layer shredded cabbage, then a few spoonfuls of the taco meat, and then top with cheese, peppers, and guacamole! !